Mandevilla is a remarkable vine. Caring for this plant, from planting to pruning and including watering, should give you magnificent flowers in summer. Follow our advice to get nice mandevilla blooms. Mandevillas are usually grown indoors in our temperate climates, even if they do well outdoors in summer, both in in pots and directly in the ground. If potted, it is advised to re-pot every 1 or 2 years, preferably in spring. Pots provided upon purchase quickly become too small: re-pot your mandevillas as soon as their blooming is over. Refer to our guidelines on how to re-pot your mandevilla. Mandevillas are native to South America and therefore require temperatures of at least 68°F (20°C) to thrive. Mandevilla planted directly in the ground copes well with direct sunlight. To boost flower-bearing, remove mandevilla wilted flowers regularly (deadheading). Pruning can be done during re-potting. Choose a very well-lit space for your mandevilla, but not in direct sunlight behind a window. Bring your shrub outdoors from May to October to give it fresh air. When potted, mandevilla needs a lot of moisture and likes being placed on a bed of constantly moist gravel or clay pebbles, since this recreates its natural environment. The usual blooming season for mandevillas is from March to November. Outdoors, mandevilla does great near walls, lattices, trees or poles where their climbing abilities are highlighted. 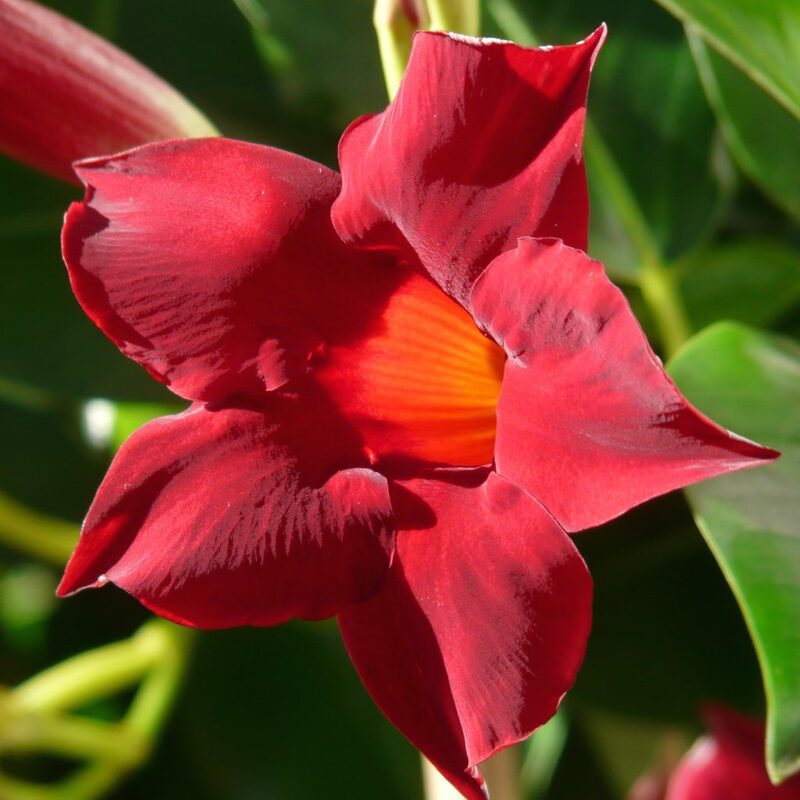 Mandevilla does well in greenhouses where moisture levels are high, so if you wish to grow in an apartment or indoors, spray its leaves often with soft water. 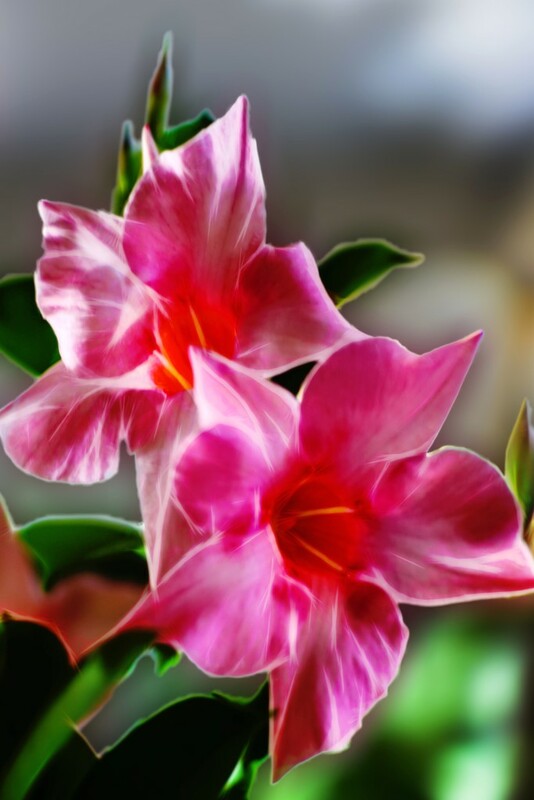 Mandevilla is toxic when ingested and irritates skin when touched, so wear gloves or wash your hands after handling. The name “Mandevilla” was given to the plant in honor of a British envoy to Argentina, Henry John Mandeville, at the end of the 18th and beginning of the 19th century. Mandeville also introduced Ipomoea indica, another beautiful vine with trumpet-like flowers in hues of blue. 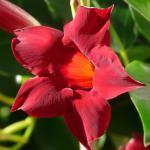 Another famous houseplant, Dipladenia, is actually a special type of mandevilla. It grows into bushy shrubs that tend to hang over instead of climbing up like regular mandevilla vines. Mandevilla splendens x amabilis ‘Alice Du Pont’ – a hybrid that bears beautiful light pink flowers with a darker pink center. Possibly the easiest variety to find in garden stores. 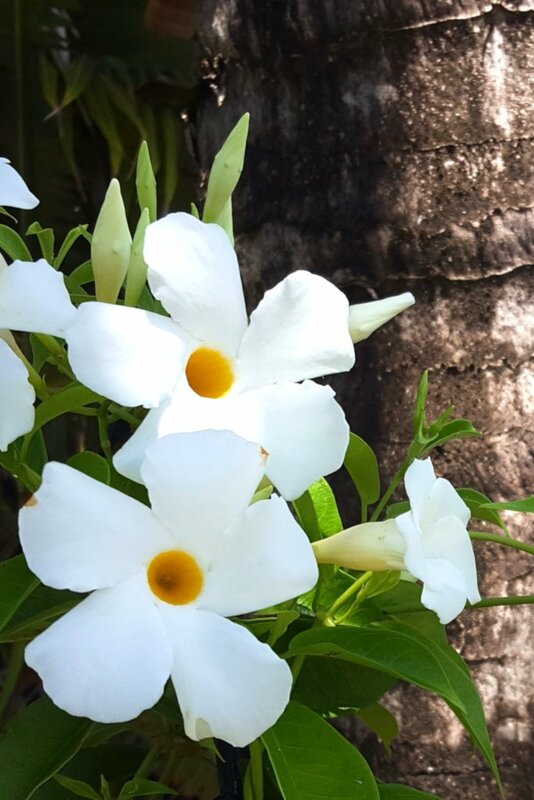 Mandevilla laxa (formerly called Mandevilla suaveolens) – also called Chilean Jasmine, beautiful white, fragrant flowers. 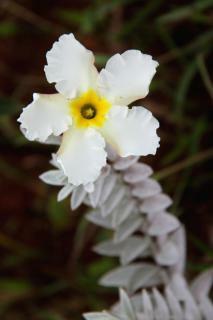 Mandevilla velame – a beautiful but rare species, shown right. Native to Brazil. Mandevilla leaves turn yellow most often when they were exposed to the cold or to lack of water. Protect your mandevillas from drafts and regularly spray water on their leaves. If a cottony white substance starts covering leaves, a scale insect colony has appeared..
Mandevilla can also be colonized by mites and ticks such as red spider mites. Adding flower plant organic fertilizer will enhance its bloom. 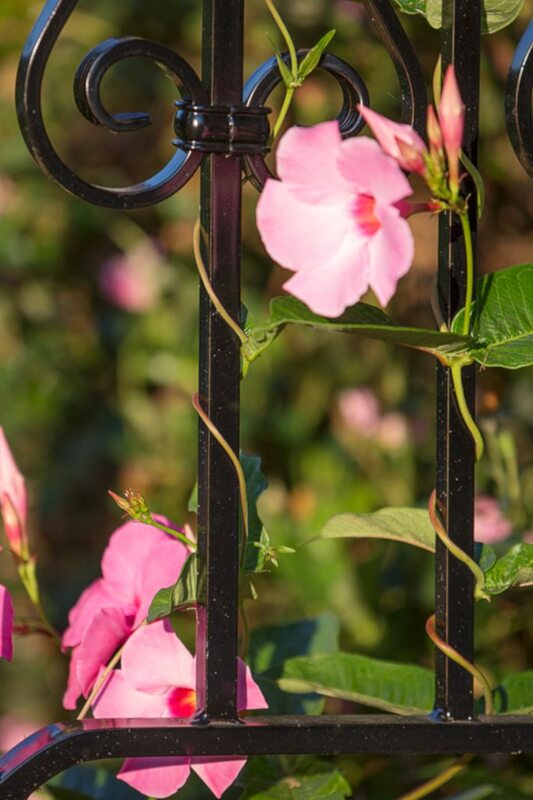 Twirling mandevilla – observe how the vine twirls when you first install it on a lattice, and ensure you wrap it around in the right direction!